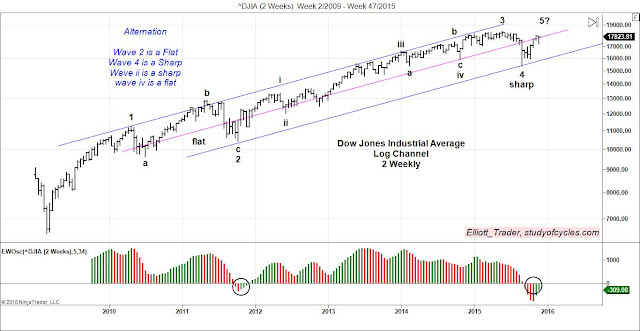 To these .. one can add a two-weekly log channel in the Dow Jones Industrial Average, as below. For each chart, the pattern of alternation is clearly stated. The last chart, that of the Dow also includes one of my favorite indicators. With 120 - 160 candles on the chart, wave iii of 3 is always at the maximum of the Elliott Wave Oscillator, the next major divergence is wave 3, and wave 4 should travel to or below the zero line - just as it has - but not more than 40% of height attained on wave 3 to the opposite side - the lower side - of the zero line... just as it has. 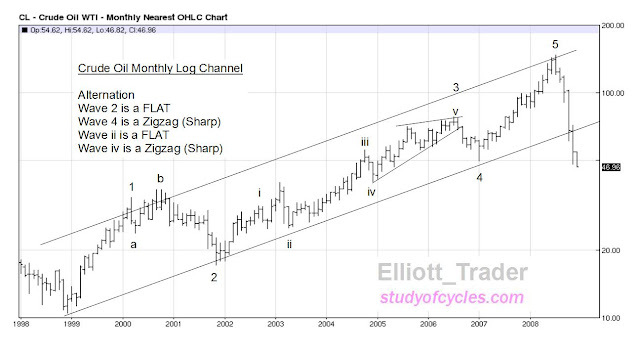 Elliott tells us to chart in log format for long term charts (weekly, monthly annually), but arithmetic is acceptable for shorter term charts (weekly, daily, hourly). Cheers and enjoy the charts! In the previous post some of the advanced considerations were able to be outlined but not illustrated by way of example. We left off that post by saying there was an 'outside day down' which is defined as a higher high, a lower low and a lower close than the previous candle. With reference to the chart below, we want to illustrate, now, some of those more advanced considerations. From Friday's candle, the "outside day down", clearly it can be seen that the futures traded down about 6 - 7 points in the pre-market Monday, but then clearly took out the high of the outside-day down. The consideration we outlined was that if the high of an outside-day down was taken out within the next two trading sessions, it would constitute a "bear trap" - as it is likely that a group of traders were caught short at the lows. Follow-through by bullish participants can be seen on today's candle (Tuesday) with yet higher highs, putting more pressure on the bears. So, then, very interestingly, Monday's candle is an "outside day up", and the same rule applies but in reverse. If the low of the outside candle up is taken out in the next two trading sessions, then it would constitute a "bull trap". So far, there is no sign of that, and it can only happen tomorrow or the signal is negated. What's good for the goose is good for the gander. There remain several things to note on this chart. First, the slow stochastic is still fully embedded. Until the %K line (the red line) crosses back down under 80, it is not likely that price will try to regain the 20-day SMA. Additionally, the 20-day SMA has recently crossed above the 100-day SMA constituting a "bull cross", the effects of which are already being seen in higher prices. How long this will last is not certain. Sometimes the cross happens very close to the point where the market enters a corrective phase, so even though the cross has happened, it, in itself, could sound a note of caution. Lastly, note that there are still two gaps, circled in red, on the daily chart which are not yet closed. While some traders may not pay much attention to gaps, sometimes they form 'targets' for the Smart Money. Disclaimer: Nothing in these observations is to be taken as trading or investment advice. Ira Epstein is a broker who works for the Lind Group, and has published numerous videos on YouTube. From that information, a summary of his Rules for Trading that he provides to the public is distilled below. These rules apply to the daily futures chart only. To follow his system, the following is needed. A current example chart that meets these requirements appears below. Bollinger Bands are defined as a daily algorithm designed to keep the market trading within them 95% of the time. The Bollinger bands were developed by John Bollinger, and are 'volatility bands' constructed around the 18 day (or 20 day) moving average where the upper band and lower band are set at "two standard deviations from the moving average". The "two standard deviations" are what theoretically provide the 95% confidence level that the market will trade within the bands. One does not want 100% confidence of trading within the bands because one is looking for signs of strength when price exceeds a band, and one is looking for signs of weakness when price can not quite hit a band as a price target. These bands expand and contract with the volatility in the market. When they contract (get narrower) they often indicate a current period of 'consolidation' in the market. When they expand, they often indicate a time period when the market is trending. When the bands get narrow (consolidate), it often precedes a time when the market will trend. Sometimes prices will be expected to close outside of the bands. Because of the small probability (5%) of trading outside of the bands, the number of consecutive closes outside of the band will typically be small 1 - 3 is common, whereas 4 - 7 closes outside of the bands is a very, very low probability event. The greater the number of consecutive closes, the lower the probability. The slow stochastic (with parameters 14,3,3) is a price oscillator developed by George Lane, a large Chicago-based grain futures trader. The slow stochastic is a 'bounded' indicator, and can only travel between 0 & 100%. On the daily chart, values below 30% are defined as "over-sold", and values above 70% are defined as "over-bought". Over-bought and over-sold on this indicator are potential reversal points in the market. However, an exception to over-bought and over-sold conditions is when the slow stochastic has 'embedded'. The slow stochastic is said to be embedded whenever one of these two conditions is met: both the %K and %D line of the slow stochastic is either over 80%, or under 20% for three consecutive days or more. Line in the sand - the 18 day (or 20 day) simple moving average is termed "the line in the sand". This is a line to which daily price often returns. It is considered to be the 'neutral point' on the chart. Prices often 'return to the line in the sand' to regroup either before or after an important economic announcement. This 18 day SMA is also a "battle ground between the bulls and the bears" and the point where one group tries to wrest control of the market from the other group. Positive bias - the market is said to have 'positive bias' whenever it has closed above the "line in the sand". Negative bias - the market is said to have 'negative bias' whenever it has closed below the "line in the sand". Swing line uptrend - prices show higher highs and higher lows 'over' the 18-day SMA. Swing line downtrend - prices show lower lows and lower highs 'under' the 18-day SMA. Outside reversal day - same as in all technical analysis (outside day up or down). Smart Money - Smart Money is defined as the large hedge funds and institutional traders who have account sizes large enough to make a difference in price movement as seen on the chart as opposed to retail traders who account sizes typically don't affect the overall trend of price. Riding the Bollinger Band - there are several times when prices will close exceptionally close to an upper band or a lower band for 'several days in a row'. This often happens when the slow stochastic 'goes embedded', either higher or lower. This is a strong trending sign for prices. One looks to buy a new long position when prices first exceed the 'line in the sand' to the upside. The target for this position is the "upper Bollinger band". This is because prices have shown they now have a positive bias, and the trade is in the direction of the prevailing trend. One does not look to buy long when price is below the 'line in the sand', because prices do not yet have a positive bias, and the trade is not yet in the direction of a prevailing trend. One looks to initiate a new short position when prices first exceed the 'line in the sand' to the downside. The target for this position is the "lower Bollinger band". This is because prices have shown they now have a negative bias, and the trade is in the direction of the prevailing trend. One does not look to initiate a new short position when price is above the 'line in the sand', because prices do not yet have a negative bias, and the trade is not yet in the direction of a prevailing trend. One looks to sell to 'take long profits only' at the upper Bollinger Band. This is because there is only a 5% probability or less (by definition of the band) that price will trade outside of the bands. The 'Smart Money' is lightening up on long positions at the upper band. If new longs were initiated, this means the retail trader would be fighting what the Smart Money is doing. Similarly, one does not look to initiate new long positions at the upper Bollinger band. This is because of the same probability that such a trade only has about 5% probability or less of success. 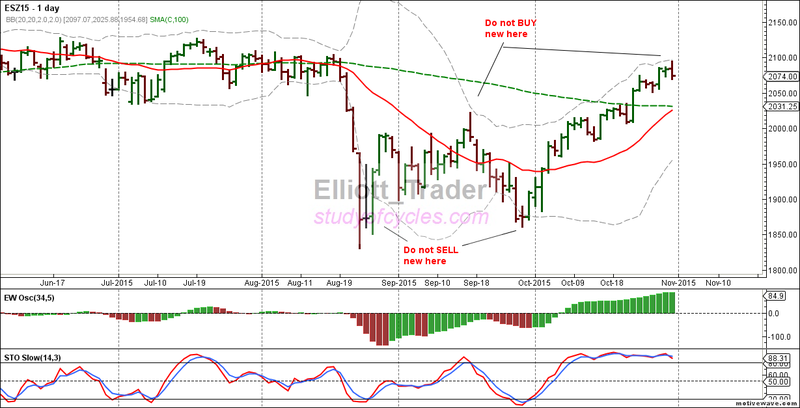 One looks to buy to 'take short profits only' at the lower Bollinger Band. This is because there is only a 5% probability or less (by definition of the band) that price will trade outside of the bands. The 'Smart Money' is lightening up' on short positions at the lower band. If new shorts were initiated, this means the retail trader would be fighting what the Smart Money is doing. Similarly, one does not look to initiate new short positions at the lower Bollinger band. This is because of the same probability that such a trade only has about 5% probability or less of success. When the slow stochastic has 'embedded' it is one of the strongest of the technical signals. If prices are going to 'ride the bands' in an up trend, this will most often be accompanied by a slow stochastic which is positively embedded over 80. When the slow stochastic has 'embedded' it is one of the strongest of the technical signals. If prices are going to 'ride the bands' in an down trend, this will most often be accompanied by a slow stochastic which is negatively embedded under 20. Since the third day defines day when the stochastic goes 'embedded or not', the second day over 80 or under 20, is the day 'most at risk' for prices to reverse since, most often, the slow stochastic does not embed. Most often, the slow stochastic just goes from over-sold to over-bought and vice-versa without embedding. When the slow-stochastic has been over-bought, then when the slow stochastic reverses to under the 80 level, then it is most common for price and the 18-day moving average to meet. This does not always happen, but it usually does. When the slow-stochastic has been over-sold, then when the slow stochastic reverses to over the 20 level, then it is most common for price and the 18-day moving average to meet. This does not always happen, but it usually does. When the slow stochastic has embedded in either direction, it is often seen - that when prices return to the "line in the sand" - then the line in the sand will be defended in the direction of the trend that embedded. In other words, price will generally 'bounce off' of the line in the sand and resume the trend. This doesn't always happen, but it often happens. When there has been an outside reversal day down, the high of that day should not be taken out higher in the next two trading days or else it constitutes a 'bear trap' - meaning that a number of players have been trapped in their positions at the lows. When there has been an outside reversal day up, the low of that day should not be taken out lower in the next two trading days or else it constitutes a 'bull trap' - meaning that a number of players have been trapped in their positions at the highs. When the 18-day SMA crosses above the 100-day SMA, some moving average followers will view this as a positive sign. If this happens when price is above the moving averages the cross over can be considered valid. When the 18-day SMA crosses below the 100-day SMA, some moving average followers will view this as a negative sign. If this happens when price is below the moving averages the cross over can be considered valid. Often times the 100-day SMA acts as either a price target or support / resistance depending on it's relationship to the 18-day SMA, and/or the Bollinger Bands. While these rules may 'seem' complex, the example chart above helps to clarify them. From June 17 - August 1, price could not attain the upper Bollinger Band, and this is a sign of weakness, not strength. In mid-July price made it's target of the lower Bollinger Band, this is a sign of weakness, not strength. Throughout early August, price can be seen to be trading for multiple days on "both sides of the line in the sand", there is clearly a battle going on for control of the market. Further, there is a narrowing of the Bollinger Bands indicating a period of consolidation, to be followed by a breakout in one direction or the other (more likely lower given the above information). When prices break below the mid-August low, the Bollinger Bands begin to widen to the down side, indicating a trend beginning. This breakdown occurs under the 20-day SMA, and would be sold, as the market would have lower lows and lower highs (a swing line trend) under the line in the sand. Prices begin to "ride the band lower" as the slow stochastic embeds under the 20-level indicating the down trend in force. 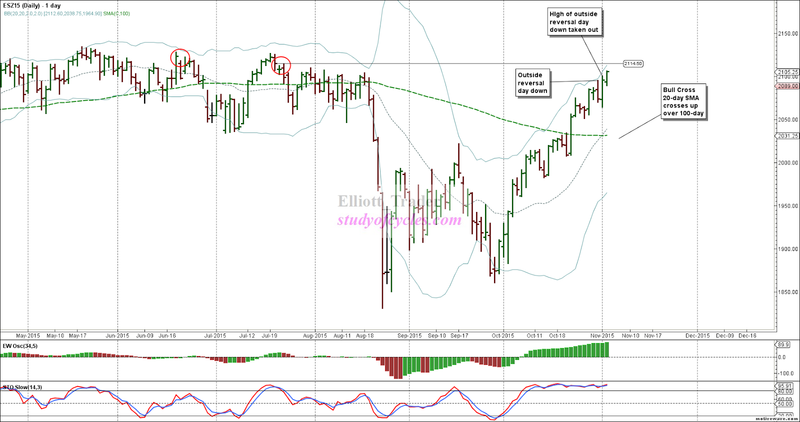 Profits are allowed to build until the slow stochastic turns back above the 20 level, around August 23rd. When the slow stochastic turns back up over the 20 level, it is 'most often' expected for price to meet the line in the sand, and that is what occurs in mid-September. One does not initiate new shorts against the lower band in late August, per the above rationale as the probability of success is 5% or less (less for every day that price closes below the band). One does not initiate new long positions in early September as price has not closed above the "line in the sand". A new long can be initiated in mid-September, after price closes back above the line in the sand. The target for this trade is the upper Bollinger band. One would not initiate new longs on September 19th, when price is very near the upper Bollinger Band, as the probability of success is only 5% or less, of success. However, profits should look to be taken. A new short position is not initiated in mid-September because price has not closed below the line in the sand. When the slow stochastic turns back under 80, it is 'most often' expected that price will meet the line in the sand, and that is what does happen in mid-September. A new short position can be initiated in late September after price closes below the line in the sand, with a target of the lower Bollinger Band. 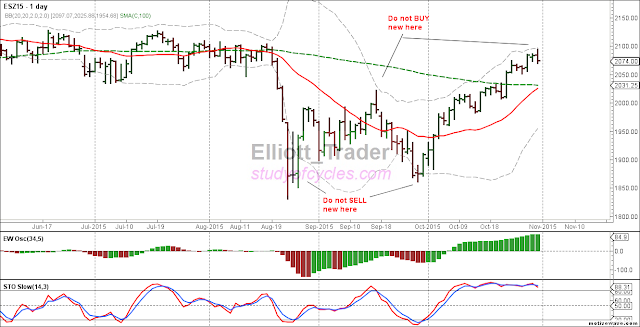 One would not initiate new short postions in late September when price closes on the lower Bollinger Band, as the probability of success is only 5% or less. However, buying back shorts to take short profits should be initiated. One would not initiate new long positions in later September as price has not closed above the line in the sand. In early October, price closes above the line in the sand on the second trading bar. One then looks to initiate new long positions with a target of the upper Bollinger Band. In late October, price has hit the upper Bollinger Band and one would look to take at least-some profits on long positions. The slow stochastic has not yet crossed back under the 80 level from being embedded, so a trader may still wish to let some partial positions run until it does. This is discretionary. The last daily bar is an "outside range day down", meaning if the high of this bar is taken out in the next two trading sessions, it could constitute a 'bear trap' - meaning some players have most likely been caught short in the trade - presumably giving the market more fuel for a further upside run. Because the slow stochastic is still embedded for many more than three days, when it eventually turns down under 80, and price and the moving average begin to meet, it is a high probability that the line in the sand will be defended! Meaning price will bounce off the 18-day SMA, and resume a turn higher. This does not always happen, but it often does! Repeat this Cycle, and these Instructions Continuously! 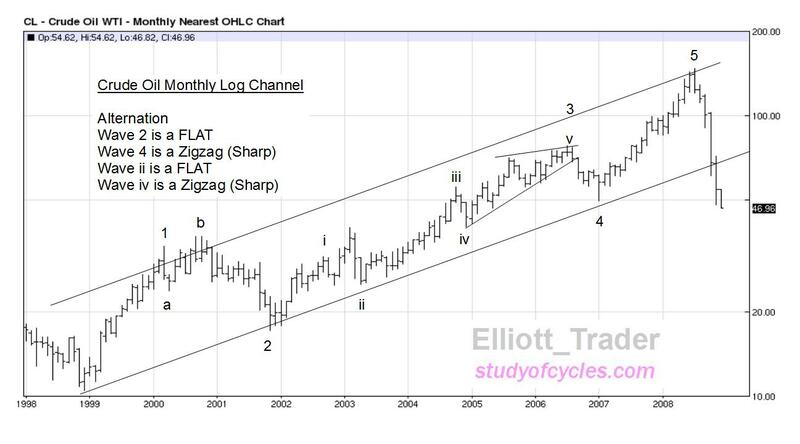 We post this information to show two things: a) we care about trading as much as we do about counting Elliott Waves, and b) sometimes Elliott Wave counting can be a great 'assist' to trading, as in when the longer direction has been established. 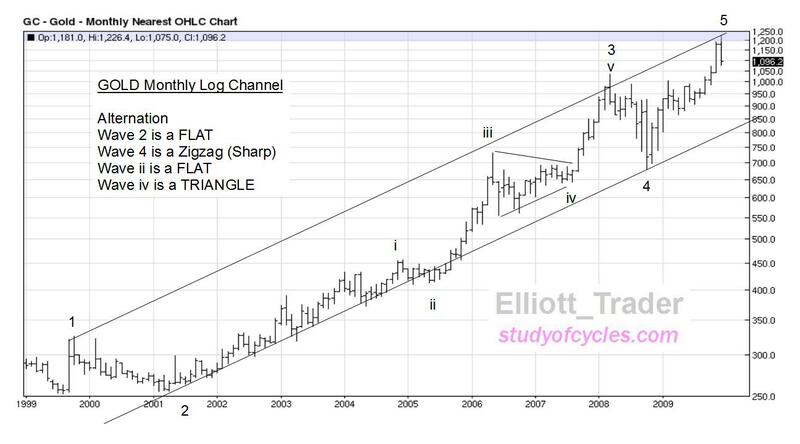 One can 'filter out' short trades or 'long trades' in the above system based on the Elliott wave count in the market. Other times, like now, Elliott Wave analysis can have clear alternatives, and, in such cases one may rely more on plain technical analysis or a trading system like this to help screen for potential trades. Disclaimer: We make no claims for the profitability of the above rules. All trading results are determined by your decisions, and we accept no responsibility for them. (*) The Swing Line study is one developed by Ira Epstein, and only appears in charting software he provides. To respect the proprietary nature of this indicator, we have not reproduced it here. Instead, if you are interested in examples of the Swing Line study, go to YouTube, and search on Ira Epstein. Any one of his "End of the Day Financial" videos, "Currency" videos, or "Metals" videos will have the indicator applied to the chart.